doesn’t need very much explanation. Today is one of those days. You and I know what the treasure is that he speaks of. the fellow stumbles upon it; and that happens to us. are things we used to chase after. looking for meaning, and we try everything. Nothing really satisfies. The treasure is Jesus himself: knowing him, and being with him. someone doesn’t just give us the pearl. Everything goes on the line. It takes effort and full commitment. We trade in everything else we value. Lots of people know God exists – and they believe Jesus is the Messiah. They think believing in God is a good thing. sort of like exercise and fresh fruit. But that’s not what Jesus was talking about in the Gospel. He’s talking about going all in. Only when we really put something on the line, do we really know him. Not know about him, but knowing him. That changes everything. Here’s the really good news: you and I don’t have to search. This Friday evening, we have a special opportunity to draw close to him. we have adoration of the Blessed Sacrament. until Mass on Saturday morning. and anyone can come and pray. that is, the heart of Mary, and the heart of Jesus. and then in her womb by the Holy Spirit. the treasure of Jesus’ heart is hidden there for us to discover. As I say, we do this every month on the First Friday. so that will be unfamiliar to some. But we have booklets you can use to follow along. we don’t discover the pearl of great price easily. as a focal point of devotion and prayer. which I know Father Amberger made some years ago. Now, there are a lot of ways to look at this. and promised by Mary to the children at Fatima. and through her visit, God set great things in motion. 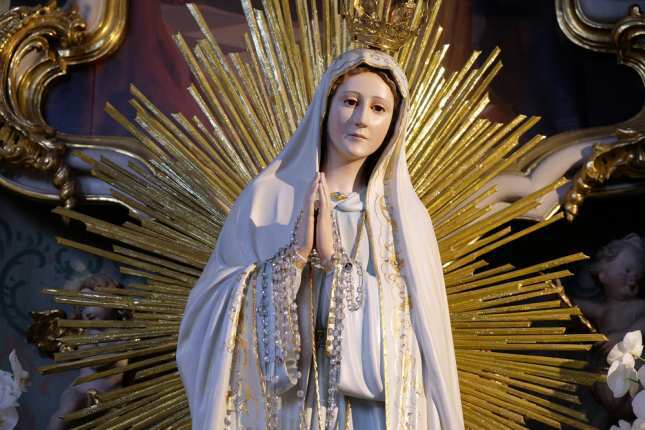 of what Mary told us at Fatima, there is a sense that there’s more. in the end, her Immaculate Heart will triumph. Mary is the one chosen by heaven to bring the Messiah. they would do everything to change their lives." To give everything – to have the Pearl of Great Price. and ask her to help us turn back to her Son. her Son, our brother and our Savior and Lord. He is what we long for, and what is worth giving up everything to have. * Update: the words in a different color were added at Mass.